Éireann (pronounced [ˈeːɾʲə an]) is an nation made up of four islands that lie to the northwest of Scandia. To the east of Éireann is Arendaal and the Isle of Rosenburg (Tyskreich) separated from Straits of Éireannand to the south is Batavie. 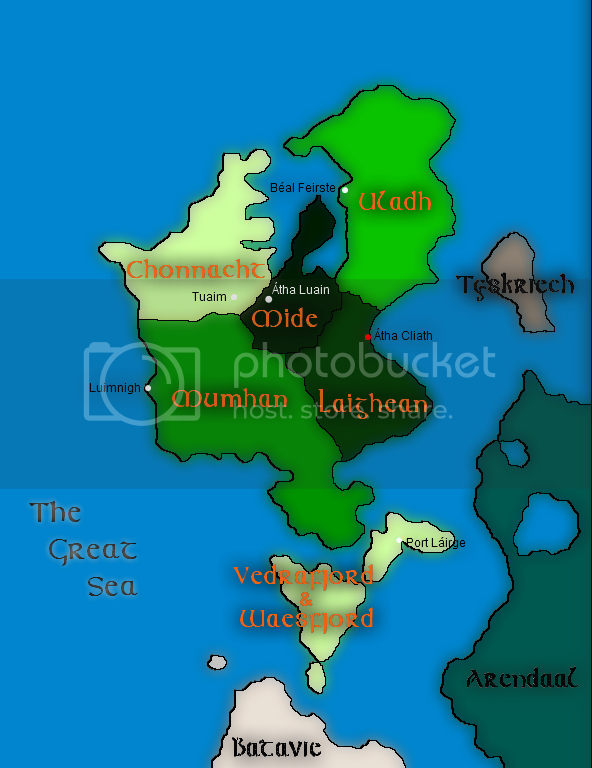 The islands is divided into cóiceda or "fifths", each corresponding to the anchient kingdoms while the three southern isles or "Isles of the Jarls" once ruled by the nordic tribes from Arendaal. The population of Éireann is approximately 25 million people. Relatively low-lying mountains surrounding a central plain epitomise Éireann's geography with several navigable rivers extending inland. The island has lush vegetation, a product of its mild but changeable oceanic climate, which avoids extremes in temperature. Thick woodland cover the island and there are twenty-six extant mammal species native to Ireland. Though there has been many attempt to invade Éireann, since the rise of the High King only one has been successful, that one was the Tyskreich invasion and occupation (1941-1947) in the Great War during which time a great deal attrocities were committed against the HÉireannaigh by the occupiers and is a creating what is still a perceptual resentment toward Tyskreich. Éireann culture has had a significant influence on other cultures, particularly in the fields of literature and, to a lesser degree, science and education. A strong Irish culture exists, as expressed for example through Gaelic games, folk Music and the Irish language, alongside a common Western culture, such as contemporary music and drama, and sports such as soccer, rugby and golf, and even otherlanguages such as English.